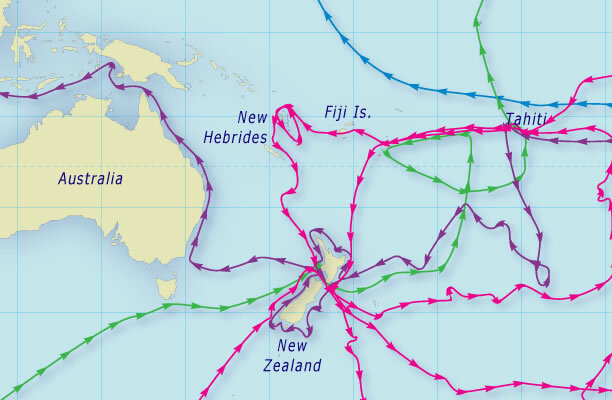 The Endeavour’s arrival at Cape Turnagain, halfway between Hawke Bay and Cook Strait, completed James Cook’s circumnavigation of the North Island and confirmed that it was not part of the fabled continent, Terra Australis Incognita (‘unknown southern land’). Cook had brought the Endeavour to anchor at Ship Cove in Queen Charlotte Sound, in the north of the South Island, on 15 January 1770. From a high point on Arapawa Island he gained his first view of the narrow strait that now bears his name. He sailed through this strait to reach Cape Turnagain before heading south down the east coast of the South Island. We have 5 biographies, 2 articles, related to Cook completes circumnavigation of North Island.